"Farnhurst Bounds. Monday 27 November 1837. Notice having been duly given to the adjoining parishes of Easebourne, Woolbeding, Linch, Linchmere, Haslemere, North Ambersham, Selham, and Woolavington that it was the intention of the Inhabitants of the Parish of Farnhurst to perambulate the Boundaries of this Parish on this and the following days to Commence at 10 o'clock in the Forenoon at the Blue Bell Inn in Farnhurst Lane and proceed Northward and Eastward treading the Parish in on the Right hand." 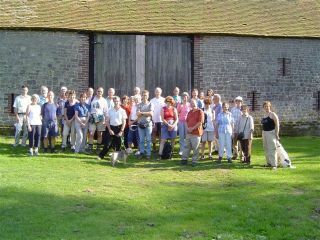 Between 2003-2006, the Society retraced the Fernhurst Parish boundary in a series of 'beating the bounds' walks, the first time this has been done since 1837. In September 2004, Jacqueline Kennett, who led thirty parishioners along the 4th stage of the walks, between Bexley Hill and Scotland Farm, wrote the following account. 1837 was the first year of the 18 year-old Queen Victoria’s reign. The economy was struggling to recover from the costly Napoleonic wars and a succession of poor summers and harvests. Many of the people living in the Fernhurst Parish were agricultural workers, woodcutters, craftsmen and tradesmen. Over decades, farm labourers had progressively lost the freedom to use strips of land and commons to eke out a living. Poaching of any kind was a criminal offence. To be found with poaching nets could result in deportation for seven years. One child in four died before the age of five in 1837 Sussex. One person in twelve of the population of England and Wales was a registered pauper. However, after 1834, outdoor relief for the able-bodied poor was no longer the responsibility of each parish. Surrounding Easebourne, seventeen parishes, including Fernhurst, had already combined to share the burden (the Gilbert Union of 1792), the solution at the time seeming to be the dreaded, divisive, workhouse which separated men, women and children. The Easebourne workhouse (now Budgenor Lodge) became the local destination for the impoverished, the aged and incapacitated. It was 1929 before the workhouse system was finally reformed. Beginning in 1830, Kent, Sussex and Hampshire went through a period of turbulence and rioting (arson, violence, the smashing of threshing machines, mass demonstrations) which was directed at landowners, farmers and the parish overseers. Labourers were demanding a wage rise to bring them up to 2s 6d a day. The average labourer’s wage was 8 shillings a week. A loaf of bread cost 1s 2d (about a day’s wages), partly due to inflated prices maintained by the protectionist corn tariff imposed on cheaper, imported grain. In Kent, troops were despatched to put down the uprisings. The Duke of Richmond (at Goodwood) enrolled shopkeepers, farmers and compliant labourers to occupy Sussex villages when trouble arose (a strategy known as ’The Sussex Plan’). The court cases saw one arsonist executed, sixteen imprisoned, and seventeen transported to Tasmania. Following the reform and modest extension of democracy in 1832, an increased number of the wealthier householders and tenants (one in twenty four of the adult population) were able to vote. Although ties of political power, patronage and land ownership had been loosened, the labourer was still disenfranchised. Between 1832 and 1837, eighteen hundred men, women and children left the parishes surrounding Petworth and further afield in order to go to Upper Canada in ships, guaranteed to be seaworthy and with adequate food, under the assisted emigration scheme sponsored by the Earl of Egremont (Petworth) and backed by the Reverend Sockett of Petworth, along with members of local parishes. Well crafted tools to take to Canada were made in Petworth for the emigrants - tools of such excellent quality that they were subsequently sought out by local purchasers. A number of emigrants from Fernhurst made a new start in Ontario. Overall, 70% were labourers, 20% rural artisans (Cameron and McDougall Maude, 2000). During his fact-finding rural rides in the summer of 1823, William Cobbett observed that, ‘All the towns in Sussex are very clean, the women are very nice in their dress and in their houses’. ‘More than in other counties‘, Sussex men and boys wore .. ‘clean smock-frocks’ (often faded, patched and darned), a plain and coarse shirt, nailed half-boots or shoes (Cobbett, 1830). All of the pigs that Cobbett saw in this part of Sussex were ‘black and thin-haired’. (The Fernhurst boundary recorders of 1837 describe the tenanted spring line dwellings on their route along the steep Verdley scarp with reference to their meadows, hog pens and orchards). Cobbett noted that Sussex orchards were ‘closely planted‘. Locally, orchards were mainly of apples, plums and damsons. In July, farmers were laying out lime along the wheat fallows. In 1837, patches of woodland around the southern boundary of the Fernhurst Parish bore traces of ancient ancestry - but much land had by then been put to cultivation as chestnut coppice for the ironmasters, glassblowers and farmers. Here and there along the boundary route were meadows and dwellings which have long given way to commercial woodland or scrub. Today, substantial areas of the Cowdray Estate that we pass through along the boundary have been replanted with conifer although, to the west of the A286 (sometimes still referred to as ‘the turnpike‘), larger tracts of chestnut coppice survive. Oxen (put to the plough and used to draw carts and carriages), cows, horses, sheep, goats, pigs and poultry would have played a significant and visible part in everyday life. The first exclusively Sussex Trust for maintaining a turnpike road was set up in 1749 ‘for repairing the road from Hindhead Heath through Fernhurst Lane and Midhurst to the City of Chichester’. Until the formation of the trust, which gave a boost to local enterprises and inns, road conditions in the area were appalling. Travellers were thought reckless if they avoided turnpikes. Excavations after the Second World War found iron slag under the stone cobbles in Old Henley, giving rise to the likelihood that these were laid by the turnpike trust in the mid eighteenth century (and not by the Romans, as some had thought) (Margery, 1948). Until 1825, extra horses could be called upon from the King’s Arms to draw wagons and carriages over the hill through Old Henley which, even today, sometimes becomes impassable to traffic in icy conditions. That section of the main road (now the A286) from the King’s Arms to the top of Henley Hill, crossed by the parish boundary at Henley Common, was constructed in 1825 to avoid the steep ascent through Old Henley. In 1837, the present Duke of Cumberland Inn at Henley was described as ‘a cottage in three acres, with barns and meadow‘. At that time, Ann Venes (‘Widow Venus‘), a widow with eleven children, was the occupant. Five years later, she married a nearby Henley resident, Thomas Puttick, twenty-four years her senior. Beside his cottage stood a granary and bakehouse - of which the cottage and granary survive. The 1851 census shows that Thomas and Ann were selling ale from Ann’s cottage. In the 1860‘s, one of the Ann’s children, David, was described as a ‘beer retailer’ in Henley. A generation later, in 1891, the cottage had been fully transformed into the ‘The Cumberland Arms’, run by a younger Thomas Puttick and Daniel Venes. By 1837, nearby canals and waterways had almost had their short-lived day. Competition saw the turnpike roads - and the newly emerging railways - increasingly transporting people, produce, coal, timber and lime. Thomas Luff (farmer) of Fernhurst (Overseer), William Luff, Richard Luff, John Luff, George Madgwick of Lower Lodge Farm, William Alywin of Collyers, Robert Lambert of Fernhurst, John Gale, John Enticknap, John Berry of Van Common, Mr. Purser (Overseer) of Easebourne, James West of Henley Hill (Reeve of the Manor), Mr. Duncombe of Guildford (Surveyor), William Berry of Haslemere and his son, William (14), Alexander Brown (Document Scribe) of Easebourne Priory, William Howick of Henley, Richard West of Dowood, George Berry of Redford, George Alder of Van Common, James Ellis, Isaac Stevens, Henry Hall (all of Woolbeding), Thomas French (Bailiff), C.F. Hector, Esq., James Graysmark of Parry’s Farm, Fernhurst, William Bridger of Scotland Farm, Thomas Bridger (his brother), Mr. Mills (joined at Highbuildings), Mr. J. Harding of Shottermill, Samuel Greenway and Thomas Glazer (joined at Vann Bridge). Ashley, Maurice (1982). The People of England, Weidenfeld & Nicolson. Cameron, Wendy & Maude, Mary McDougall (2000). Assisting Emigration to Upper Canada - The Petworth Project 1832-1837. McGill - Queens University Press. Cobbett, William. (2001), Rural Rides. Penguin Classic. Margery, Ivan (1948). Roman Ways in the Weald. Phoenix House. Silver, Brian (1999). Fernhurst - Pictures and People. B. Silver. Margaret Dorman of Colchester, Paul Farnham of Fernhurst, Roger and Barley Cullis of Fernhurst, Ted and Susan Muggridge of Henley, Kate Russell of Lynchmere, Laura Ponsonby of Lynchmere, Iain Brown of Van Common, Robin Barnes of Van Common, Gill and Peter Taylor of Fernhurst, Ingrid Taylor of Fernhurst, Judith Turner of Cooksbridge, Elaine Ireland of Fernhurst, Richard Ranft of Fernhurst, Kathleen Bird of Fernhurst, Pauleen and Les Colcutt of Fernhurst, Michael and Brenda Newman of Fernhurst, Julia Roxan of Fernhurst, Sandy Polak of Fernhurst, Terry and Glenys Parkhouse of Fernhurst, John Trussler (ex Lower Lodge, Fernhurst) of Maidenhead, Berks, Sue Trussler née Penfold ex Henley Common, Brian Silver (ex Fernhurst) of Hindhead, Thom and Emma Poole of Fernhurst, John and Jackie Kennett of Henley. 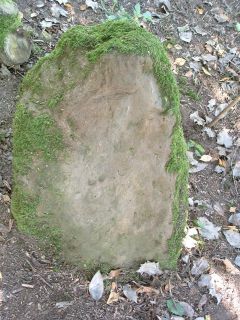 Note: a summary of the 2003-2006 series of Fernhurst Boundary walks is in newsletter no 26.